Girls Names. Photo:- Sarah Doyle. The Belfast band - Cathal Cully, Claire Miskimmin, Philip Quinn, Gib Cassidy - are currently touring their latest album Arms Around A Vision (Tough Love Records ), but already the quartet are looking ahead. "Where our music is going to go I don't know," Cully tells me during our Wednesday morning interview. "We're talking about different ideas. There may be a few changes we will experiment with, like using different instruments." "It's nice that people like Arms Around A Vision as we wanted to make it sound different from the previous albums," he says. "The main thing with this one is we're a lot more confident than before. It's the experience of the last three and a half years, developing as a band, our songwriting capabilities, and the fact we're doing this full time - being able to say, 'I'm a musician' instead of 'Sometimes I play music'." Amid the growling, spiky guitar riffs, echoing drums, and atmospherics that conjure up the foreboding, often exhilaratingly dark atmosphere of the album, can be heard saxophones, organs, detuned and broken guitars and pianos, and even sheets of metal assaulted with hammers. It reveals a band willing to expand the scope of their sound and experiment with arrangements, concepts of music making, and what can be considered a musical instrument. For their live shows, the band prefer to keep things more simple, and Cathal warns we are unlikely to see him walloping any metal sheets on the stage of the Róisín Dubh. "For touring we keep it stripped down to guitars, drums, synths, and a sampler. There'll be no string ensembles or brass!" he says. "Live, the songs are a more punkier kind of thing, more rockier, but I like that, as it pits a different spin on the songs." There are ideological and practical reasons for keeping things stripped down. "We come from a DIY ethos," Cully explains. "We keep things to a minimum and travel as lightly as possible." However, with music something many of us think we should have completely free access to, it has never been for difficult for musicians to earn a living. Ironically this comes at a time when indie and alternative music is at the healthiest and most creative level its been since the 1990s. "The only way we can make money is by touring," says Cathal. "We were just away for the last three-and a half weeks on tour and before that it was five-and a half weeks. We'll also be playing a lot of festivals, you can make money from playing festivals. The more you play the more money you make. The unfortunate thing about being a band from Ireland, or based in Ireland, is getting off the island. It costs a lot of money, so once we're away we're going to make a go of it." Cathal though is neither obsessing over the issue, nor bemoaning it, he's just stating the facts facing musicians today. "That the way it is. There is no way back or any other way in terms of music," he says. "In fairness, we are far beyond anywhere we ever expected to be. Coming from a working class background, getting a job and having a steady life were seen as the things to aspire to. People in the arts and music from my background don't really happen. It is a struggle, but it's not as if any of us are living on the streets or in poverty. We're very privileged really." Cathal is originally from Armagh, but is now based in Belfast, where, in addition to Girls Names, he works as a freelance TV producer, and on occasion has joined forces with former bandmate, Neil Brogan, in the latter's Sea Pinks solo project. 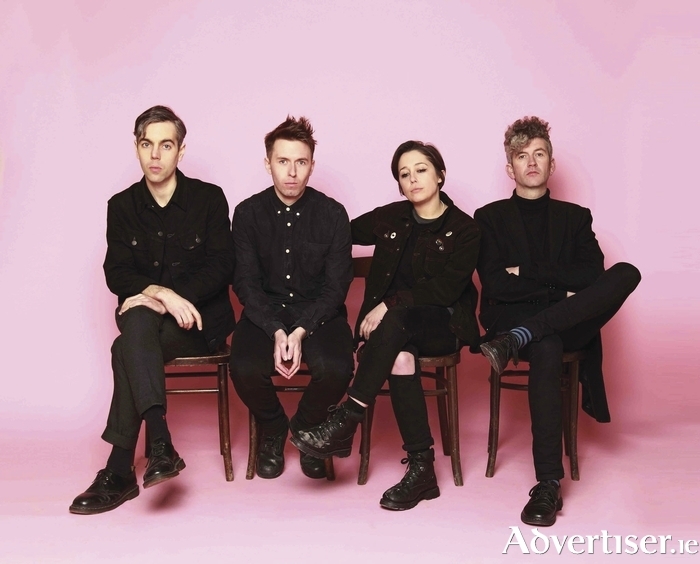 Given where the band come from, it may be surprising, but also, conversely understandable, that instead of describing themselves as an Irish, Northern Irish, or British, Girls Names consciously see themselves as a European band. This approach to identity is a result of the band's experiences as a touring act, and also to its musical inspirations. "In the last three, four, years, we've toured so much in Europe that we're more on the continent then we are at home, and people there have really taken to us," he says. "We just find ourselves inspired by being there. Based in Belfast, we kept ourselves to ourselves and didn't feel like we fitted in. We looked outwards all the time. We are inspired by Europe, but it's a romantic notion as well." He concludes by adding, part seriously, part humorously: "We're very pro-EU! - and we love travelling without the burden of boarders." That sense of Europeanness, or maybe a northern, Tutonic sense of the continental, can be heard in Girls Names' indebtedness to David Bowie's peerless 'Berlin Trilogy' of Low and "Heroes" (both 1977 ) and Lodger (1979 ), as well as the avant garde German rock scene of the 1970s. The novel approach to instrumtation clearly highlights a debt to Faust, who were not unknown to use cement mixers and chainsaws in their live concerts. "Definitely Bowie and Krautrock bands," Cathal replies when I ask about inspirations. "When I got really, really, into the nitty gritty of music, I got into post-punk bands, and no-wave, and Scottish post-punk like Josef K. All that just really hit home and stuck, as well as the idea of punk, taken to its logical conclusion - not to fall into the same route as others, but to start something fresh." Yet it is hard not to get the sense that the band's Europeanness is also a reaction to, and overcoming of, Northern Ireland's thorny, divided, and divisive senses of competing political, personal, and national identities. "I come from the border and I've been asked a lot recently about The Troubles," says Cathal. "That identity crisis is always there, especially for people my age. I'm 30 now, but the generation below me, the kids in their early 20s, are oblivious to what happened - which is a good thing. They're not as aware of the identity crisis, and instead there is this new idea developing of Northern Irishness which many on both sides adhere to. Seeing ourselves as a European band covers that, as we're not into nationalism as a whole, so that's another reason, it's more like internationalism." Girls Names play Strange Brew at the Róisín Dubh on Thursday February 25 at 9pm. Support is from The Altered Hours. Tickets are available at www.roisindubh.net, the Ticket Desk at OMG Zhivago, Shop Street, and The Róisín Dubh.